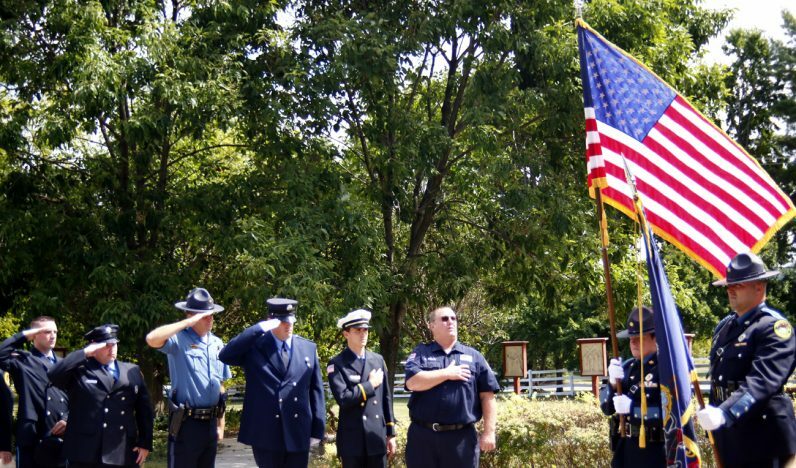 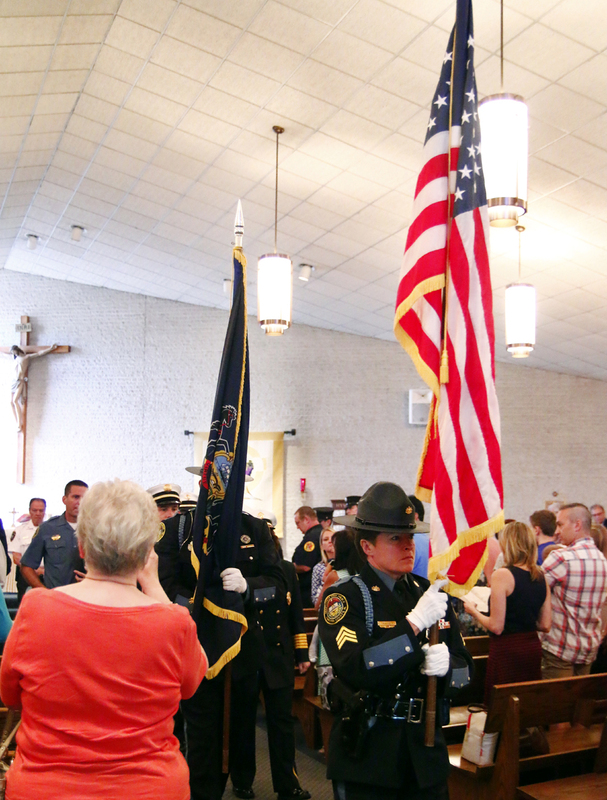 Officer Michael Spirito and Sargent Michelle Major of the Tredyffrin Police Department carry the flags in the procession of the Blue Mass at St. Isaac Jogues Church. 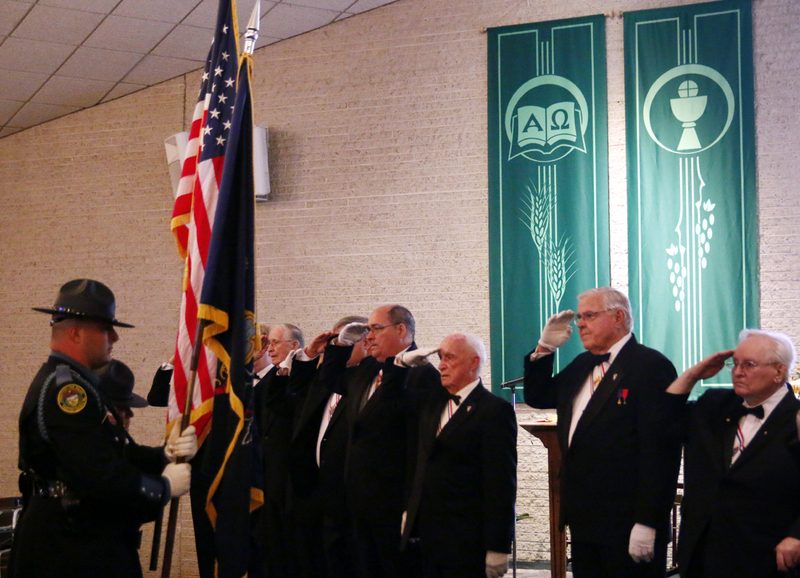 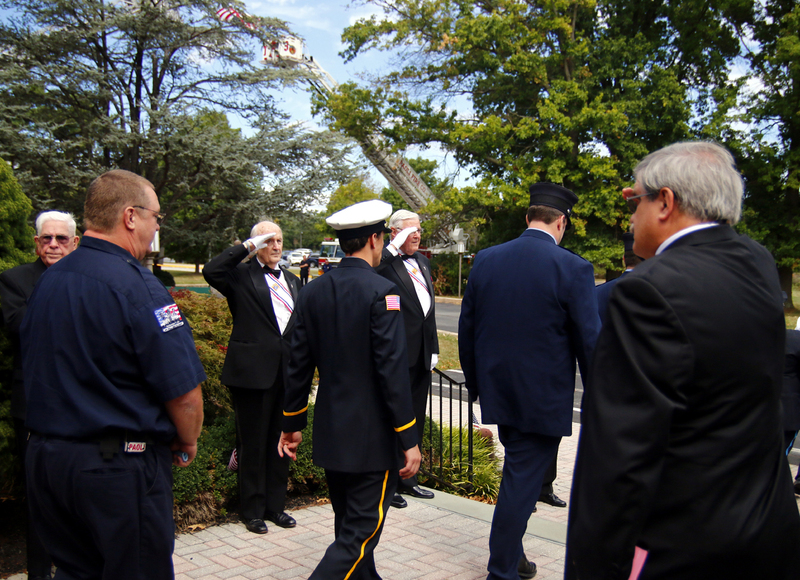 Knights of Columbus line the altar and salute the service members as they process into St. Isaac Jogues Church in Wayne. 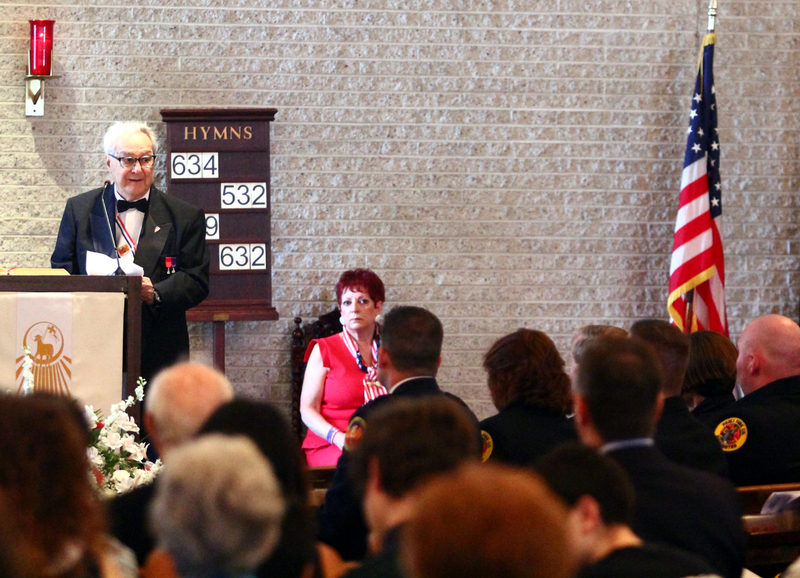 Knights of Columbus Grand Knight Joe Monte welcomes guests to the annual Blue Mass organized by the knights. 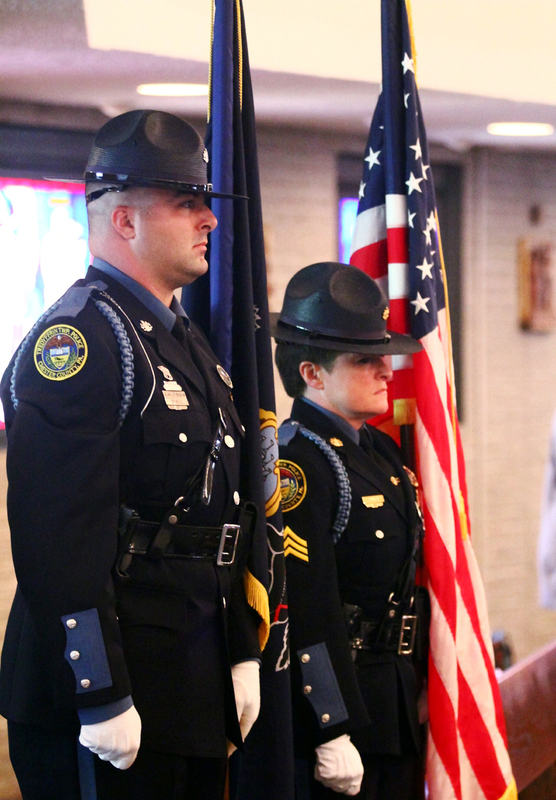 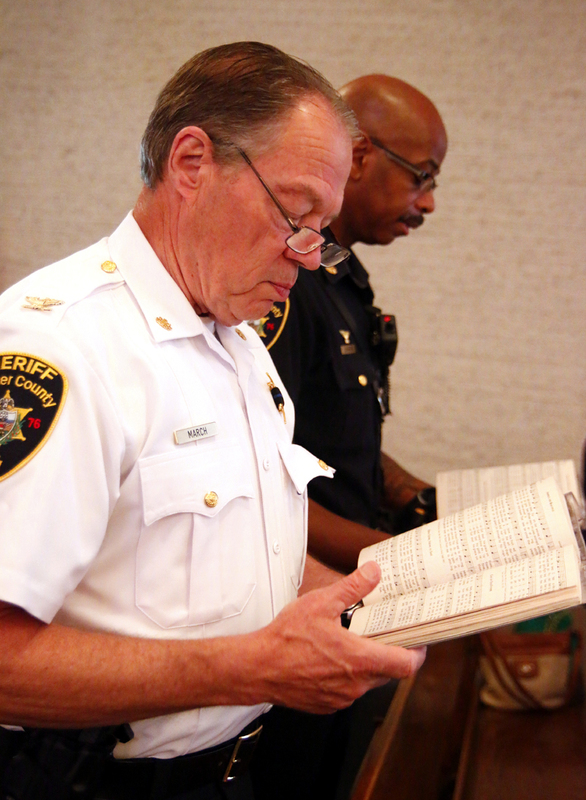 Chief Deputy George March and Corporal Wayne T. Johnson from the Chester County Sheriff’s Department pray together at the Blue Mass. 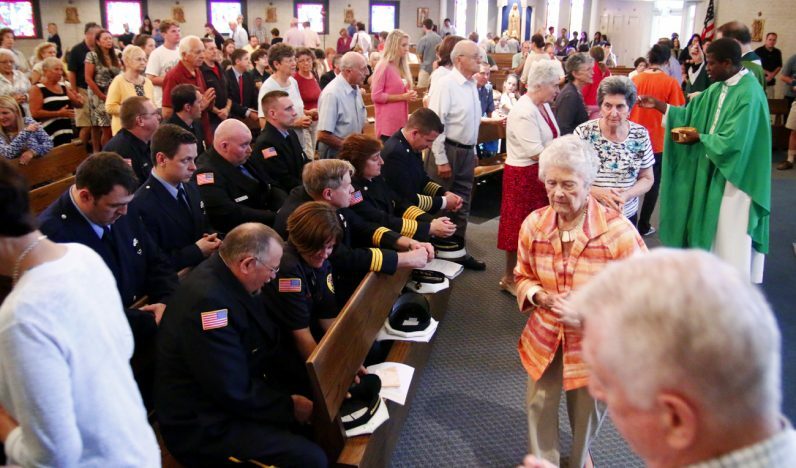 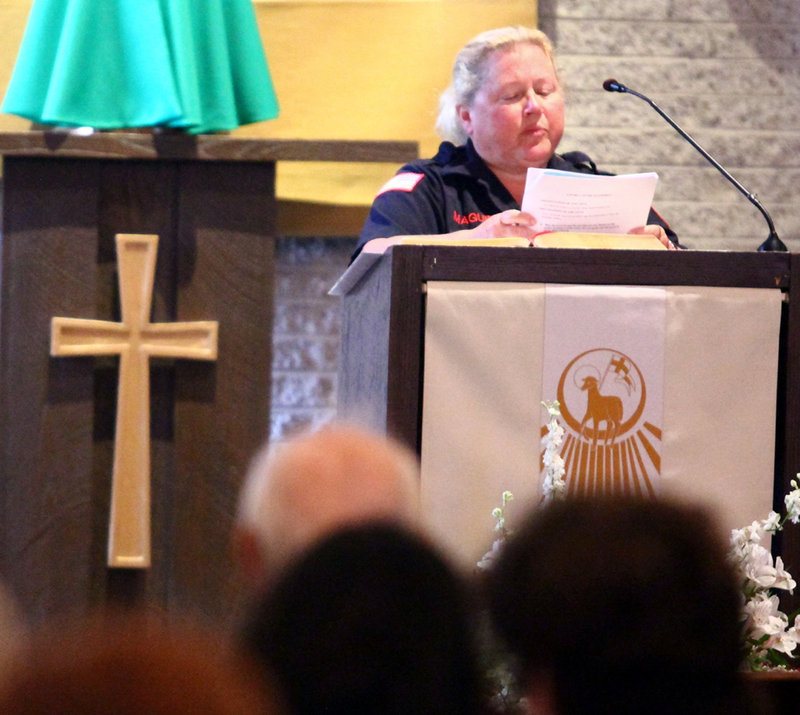 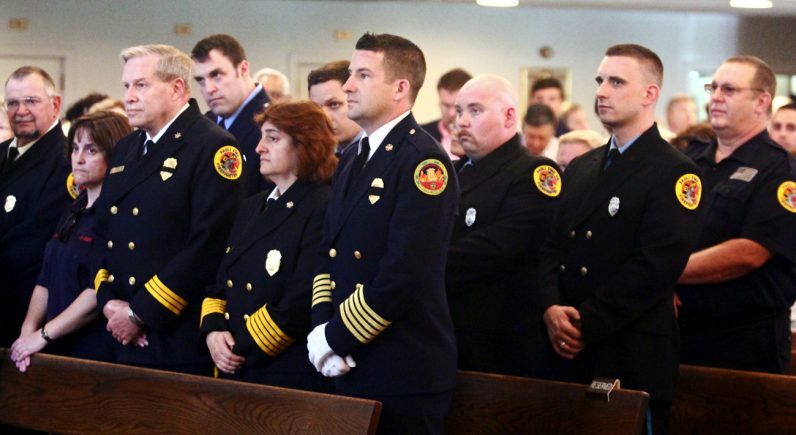 Virginia Maguire, an EMT with the Radnor Fire Company, proclaims a reading from Scripture at the Mass. 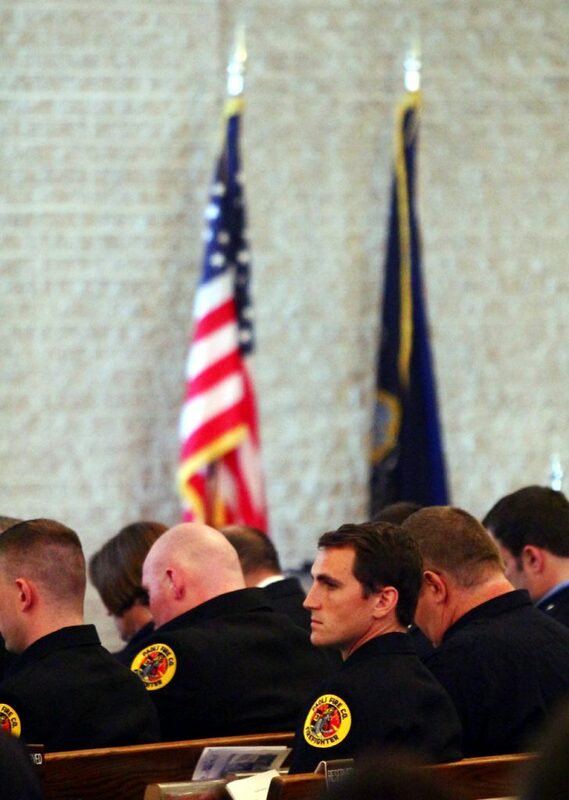 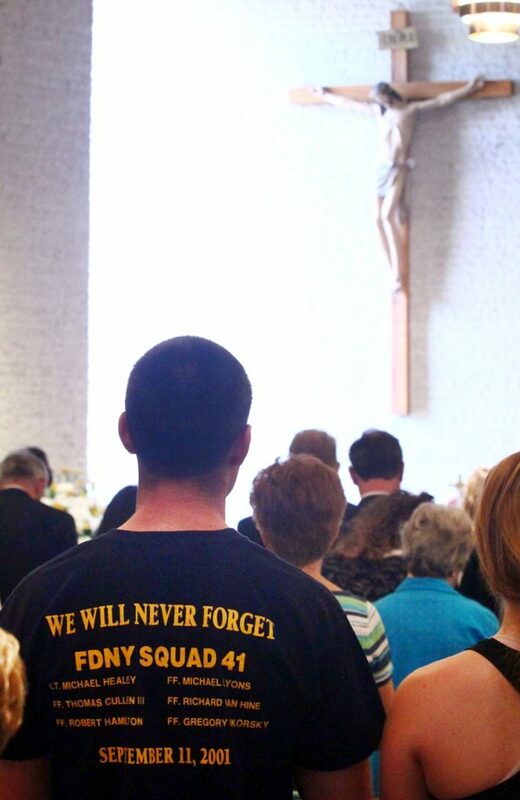 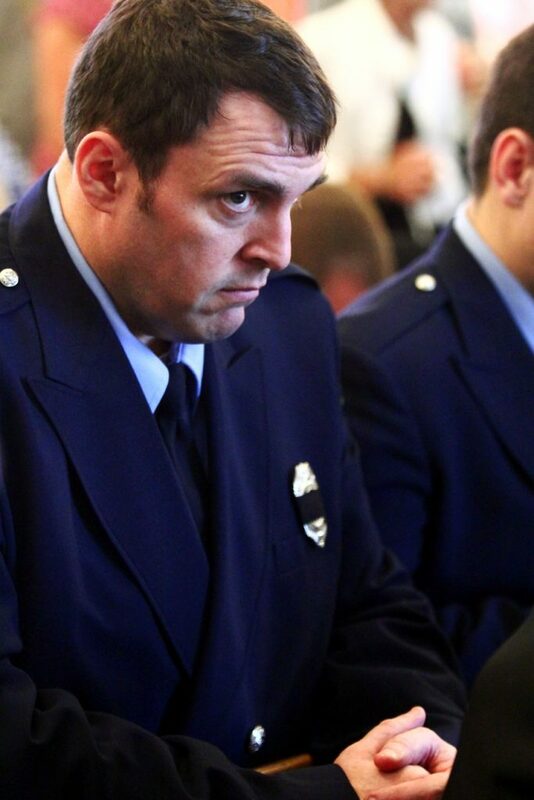 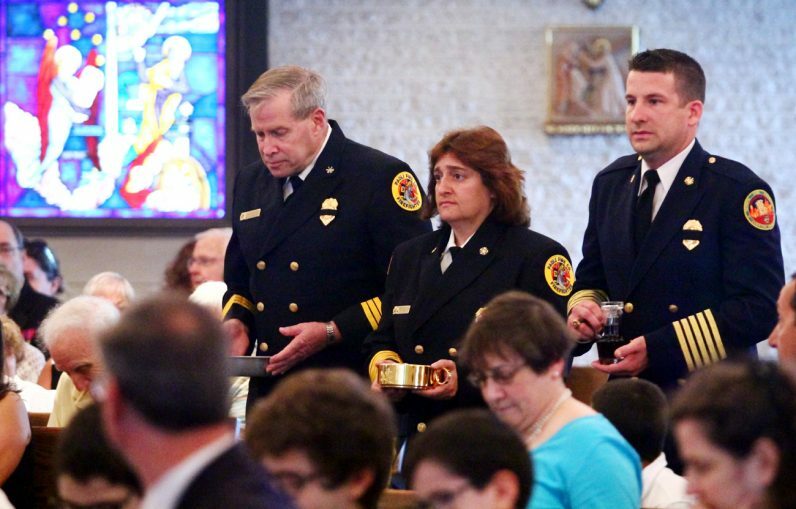 Local first responders bring up the offertory gifts during the Blue Mass at St. Isaac Jogues Church. 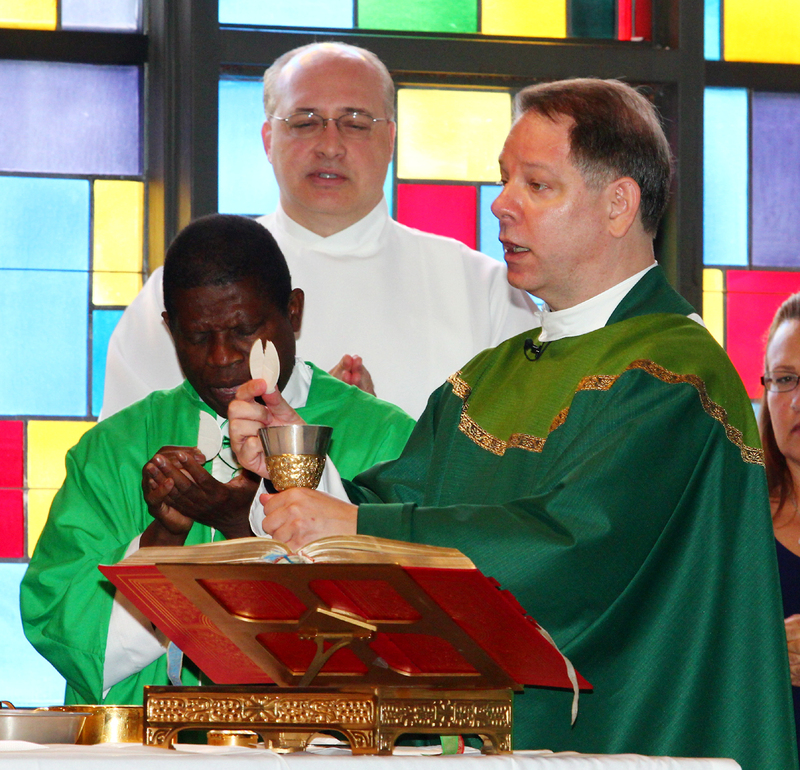 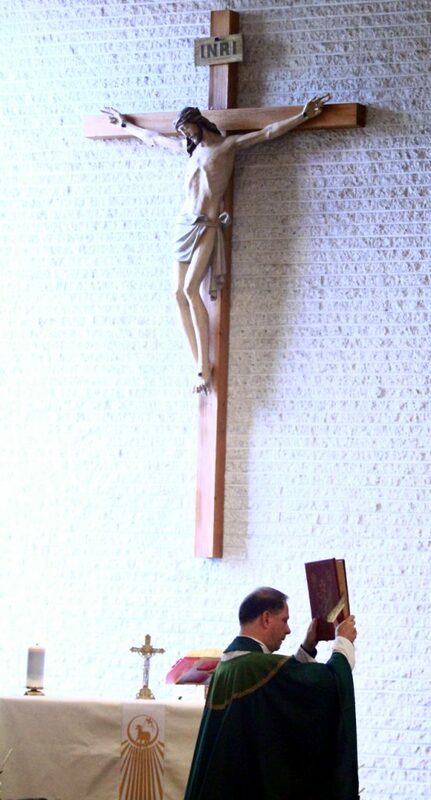 Father Stephen Moerman, pastor of St. Isaac Jogues Parish in Wayne, celebrates the annual Blue Mass on Sunday, Sept. 11. 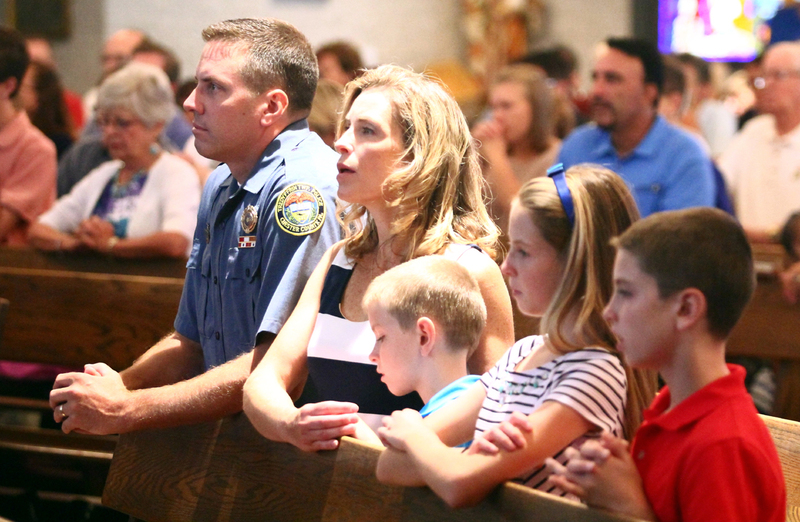 Officer Joseph Butler, director of the Community Policing Unit of the Tredyffrin Police Department and a member of St. Elizabeth Parish in Upper Uwchlan, prays with his family during the Blue Mass at St. Isaac Jogues Church. 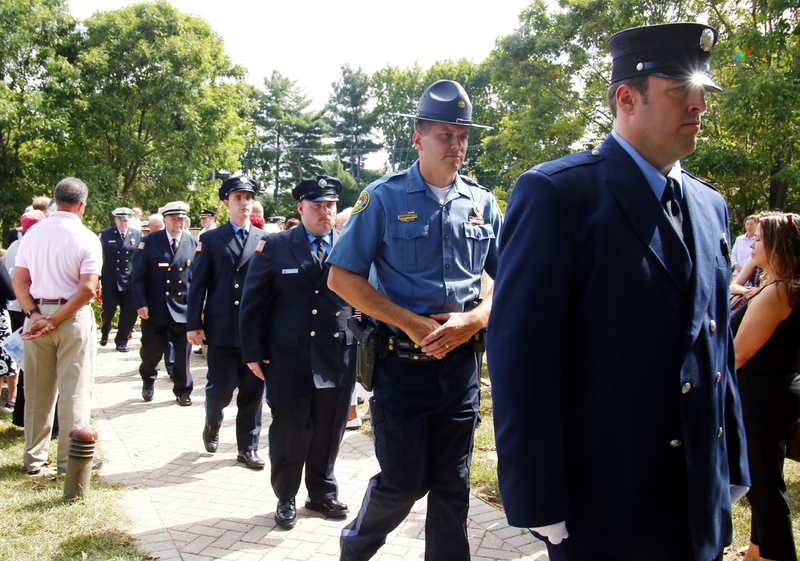 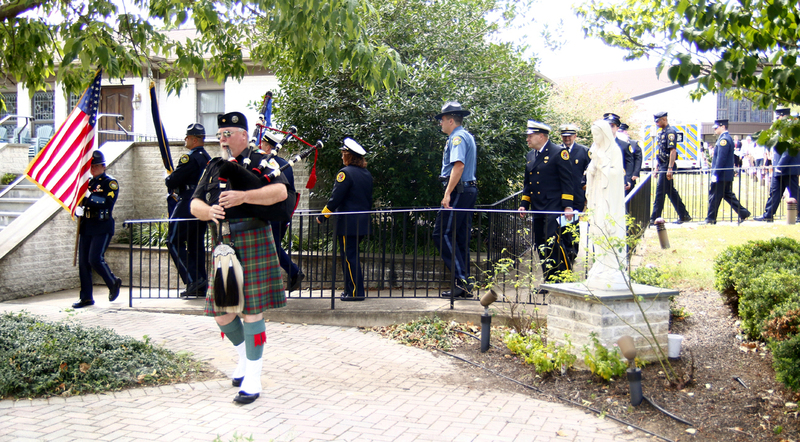 Sargent Michelle Major leads the procession from the church to the prayer garden after the 12 noon Mass. Color guard William Wilfong leads the procession from St. Isaac Jogues Church to the prayer garden for the ringing of the bell ceremony following Mass. Knights of Columbus, who organized the Blue Mass, salute the service members as they process to the prayer garden for the ringing of the bells. 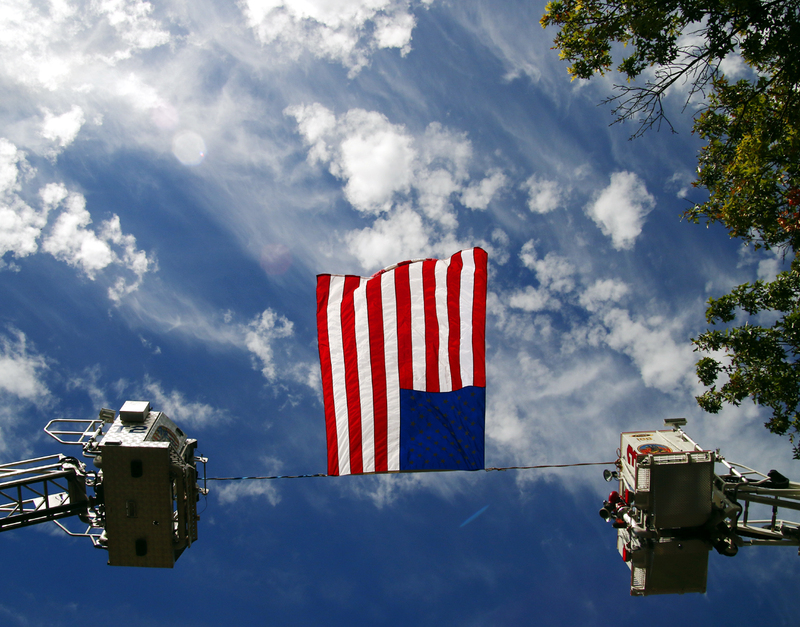 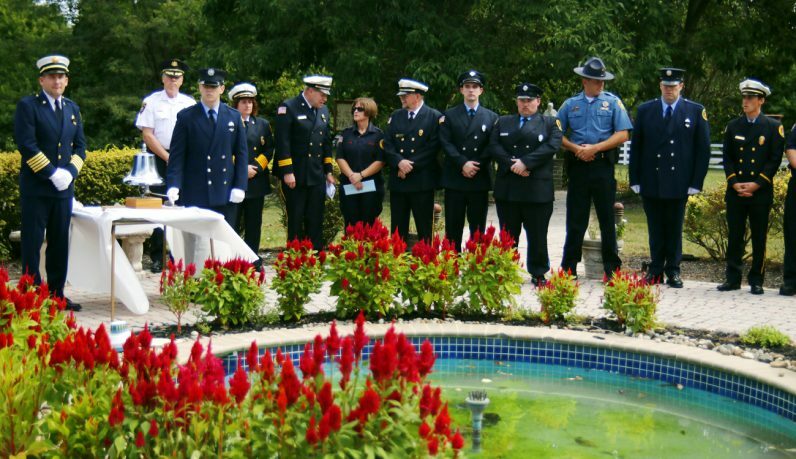 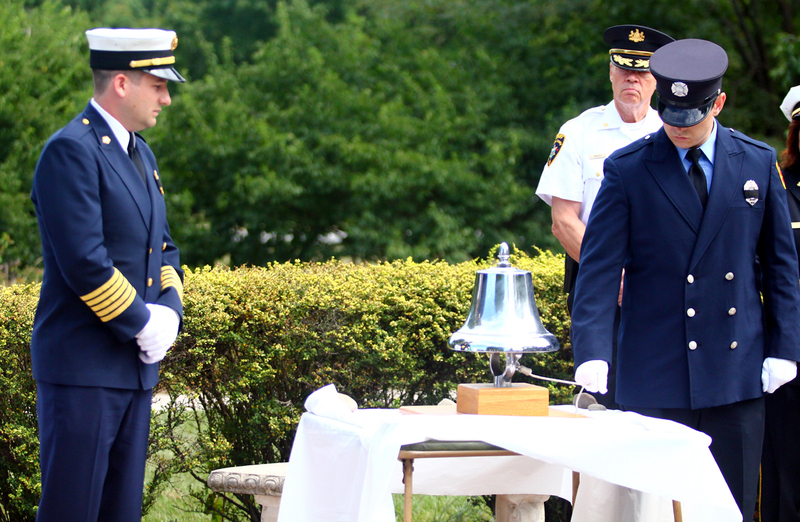 Chief Eamon Brazunis looks on as firefighter and EMT John Lichman of the Berwyn Fire Company rings a bell in honor of those who lost their lives in the terrorist attacks of Sept. 11, 2001.